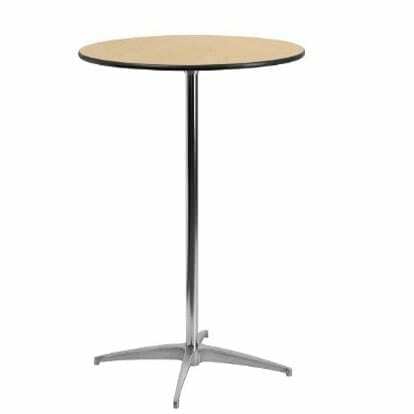 30 Inch Round Tables Hightop features a wooden top with a metal base. This typical cocktail table rental is portable and arrives fully assembled in the desired height. Some popular uses are as a: cake table, cocktail table and accessory table. This rental table seats 2-3 guests with bar stools. It can also be used without bar stools as a place to rest drinks and snacks while socializing. The round style allows for social interaction as well as many layout options. We also rent 36″ Round High Top Tables. About Delivery: We provide white glove delivery service and hence will set up all of your tables and chairs. We require that you provide us with a pre-planned table and chair design well in advance of your event. This enables our team to provide you with the best customer service and ensures a timely install and smooth event. Thank you in advance for your collaboration! Need help planning your event space? Our Planning Page can help answer space planning questions. Not sure what you need? Let our Pro Tips light the way. Not sure which linen to select, click here for Linen Sizing Guide.